Tasty new treats on itch.io and Steam. Sometimes I look over the new releases on itch.io, Steam, or wherever, and I notice a theme. This is usually just the pattern-finding right brain doing its thing and making connections where there's only coincidence, but it's fun to let it. One month after Overcooked suddenly everywhere I looked I saw new indie games about food—growing it, cooking it, and sometimes turning it into cars and driving around in it. Food is having a moment. The reason we can't afford a house is definitely because we like avocado on toast, and people photograph their food at every restaurant you go to. (Last night I tweeted a picture of ceviche. I should be ashamed.) Why is everyone so into food right now? Is it because it's a thing we enjoy but can't download? Maybe until we can torrent a burrito food will occupy the place in our cultural conversation music is vacating. You like pizzas? Name five of their toppings. Anyway, here are seven games about food I've seen this month. Stardew Valley is a great farming sim, but part of the reason it's great is that it's not really about farming. There's a town full of characters to make friends with or even marry, and the edges of a fantasy JRPG to stumble into. Where the Goats Are strips that away. You're a woman who owns goats and chickens. Everyone around you has gone, apart from the traveling salesman who stops by to sell you hay for goat cheese. Occasionally a letter arrives, but the rest of the time you shuffle back and forth between the goats and chickens. Where the Goats Are is a lonely, meditative experience where other farming games are full of bustle, and that gives it a unique potency. You can name your own price for it on itch.io. We couldn't afford a Nintendo when I was a kid so I didn't grow up with Mario Kart. Eventually I played knock-offs like Wacky Wheels and the surprisingly good Sonic & All-Stars Racing Transformed (you can be a Total War shogun!) but I don't have the nostalgic connection to Mario that ruins all other kart racers for some people. You know the Sugar Rush game from Wreck-It Ralph? All-Star Fruit Racing is the health-conscious alternative, where every racer is a fruit-themed lady. I played an avocado and collected a power-up that turned my kart into a snapping green beast. You can hurl apples and coconuts and save power-ups to turn them into Mega-Juice moves. The controls are smooth, and everything looks cute. 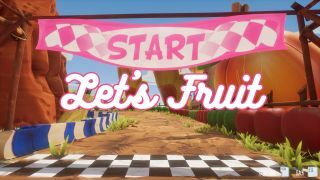 All-Star Fruit Racing is on Steam and currently in Early Access, and there's a free demo there as well. I have never been to Halifax or eaten their local delicacy the Halifax donair, but I understand it's a variant of the doner kebab. Shaved meat with sauce and other accoutrements in a bready wrap, perfect drunk food that you can save half of in the fridge and turn into perfect hungover food. I've learned about the donair thanks to Donair Academy, which pokes fun at the kind of educational games you'd get on CD-ROM in the 1990s by imagining one dedicated to this impressive foodstuff. There's more to Donair Academy than playing minigames and learning food facts, however. Stick with it and you'll encounter a twist I'd hate to spoil. Like the humble drunk food magically transforms into hungover food overnight, Donair Academy becomes something else once you complete its opening. You can play it online or download it for free at itch.io. The original Cook, Serve, Delicious! was a restaurant management game that excelled at putting you in the flow state I assume professional chefs operate in. Orders come through and you have to press the appropriate button for each ingredient (you can play with a controller but I liked the way keyboard controls match the ingredients, with B for bacon, L for lettuce, and T for tomato, and so on). Orders become progressively more complicated: you have to hold the ketchup, uncork wine bottles, hold things down to fry them, and etc. It's frantic but when you get it right you're in the zone. I haven't had a chance to play the sequel which came out on September 19, but apparently it adds a lot more ingredients (180 in total), more progression, the ability to customize your restaurant, prep stations to deal with, and more. It's available on Steam. Daylight Studios have made three very different games under the Holy Potatoes! banner. Holy Potatoes! We're in Space?! was a spaceship roguelite, like FTL but cartoony, and Holy Potatoes! A Weapon Shop?! was a business sim about an RPG vendor, the shopkeeping side of Recettear: An Item Shop's Tale made into its own game. What they've had in common is that most of the characters are odd potatoids, and this newest game takes those potatoids and sends them to Hell. In Hell you are punished by being made to run a restaurant, and must prepare food for pagan gods by turning other sinners into ingredients. They're all potatoes anyway, and sinful ones of course, so that's OK. Loki wants some mashed potatoes, so into the masher they go. Holy Potatoes! What the Hell?! will be out on October 13 on Steam. You have a tomato farm, but you don't have a pig. How are the tomatoes? The tomatoes are OK. How is everything else? Glitchy, covered in VCR fuzz, and either black, yellow, or eye-bending red. The Tomatoes Are OK is out to mess with your head, a horror game of creeping dread and surrealness that becomes stranger and more broken the more you play. Its ending didn't really work for me but it might work for you, especially if you are a YouTuber in need of shocking things. The monetization may be down, but the tomatoes? The tomatoes are OK. You can name your own price for it on itch.io. I'm cheating here, Butterfly Soup isn't really about soup. It's a visual novel about young lesbians and baseball. You play as Diya, a girl who loves baseball, food, dogs, and maybe one of her friends? Importantly for a visual novel the writing is on point: sharp, relatable, well-observed, and funny. Each of Diya's friends—the prankster Akarsha, academically inclined Noelle, and bratty Min-Seo—is distinct and likable in a very anime way. Though it's not about growing food on a farm or cooking it in a restaurant, in Butterfly Soup eating is as socially significant as it is in real life. Searching for a popcorn vendor at the baseball is a bonding experience. Noelle is your best friend because she shared food with you once when you were five, which would absolutely win my loyalty. You can name your own price for Butterfly Soup on itch.io.